This post has been on my list of things to do for months. Sorry for the delay, but consider it as a recommendation for winter reading/Christmas gifts. 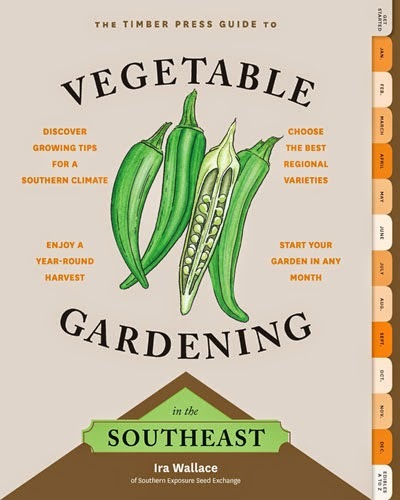 There are many excellent food gardening books out there, but few of them are specific to our climate zone here in Maryland (USDA zone 7a, at least where I live). So it’s immensely valuable to have two of them come out in the same year, especially since both are well-organized, useful additions to a gardening library. Ira Wallace’s Vegetable Gardening in the Southeast is a good reference for any food gardener, but I’d recommend it particularly to new gardeners, with the caveat that it does cover the entire southeast part of the U.S., so not every plant or technique mentioned is going to work here in the upper-upper southeast. The text specifies regional differences, however, so you’ll just need to pass your eyes over what goes on in Georgia or Florida, and stick with what’s realistic here. The book starts with a “Gardening 101” section, continues into monthly to-do lists with information relevant to each part of the year, and also includes an alphabetical list of edibles with growing, harvesting and seed-saving information, plus recommended varieties. Throughout the book, you’ll find tons of useful hints discovered through lots of on-the-ground experience. Just about everything you need to know to start and maintain a garden is touched on. You may want to seek out more detail elsewhere if you get interested in particular areas like composting or season extension, but all the basics are here in one easy-to-carry volume. Ira is one of the founding members of Southern Exposure Seed Exchange, and grows in central Virginia. You can meet her and hear her speak at the upcoming Monticello Heritage Harvest Festival – she’s a lovely person! Pam Dawling manages the farm at Twin Oaks Community, also in central Virginia, and has a lot of experience with producing food for a large group of residents who depend on a regular, reliable supply of vegetables. She’s translated this experience into a book called Sustainable Market Farming – but please don’t stop reading here because you don’t run a farm! 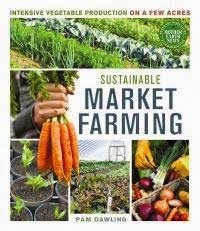 I found this book to be extremely useful for planning and managing a vegetable garden as well, because it’s based in real-life experience and is full of detailed specifics about developing plans, making the best use of space, planting, growing, dealing with pest problems, harvest/storage, etc. etc. I’d recommend this book mainly for food gardeners with a year or more of experience, but beginners could benefit from it if they’re not daunted by lots of charts and lists and nuggets of information. It’s organized to be handy, and it’s also well-written and even funny in places (why is this so unusual in gardening books?). I laughed reading this book, in a good way, and also made many “ooh!” noises of discovery and admiration. Also, the reference list is fantastic, if you want to pursue topics further. You can follow Pam’s adventures on the Sustainable Market Farming blog.